SMS marketing is an awesome mobile communication tactic, but if you’re not growing your list, you simply won’t observe long term results. So you signed up for a free plan over at Slicktext.com, and you’re now ready to draw in new subscribers. 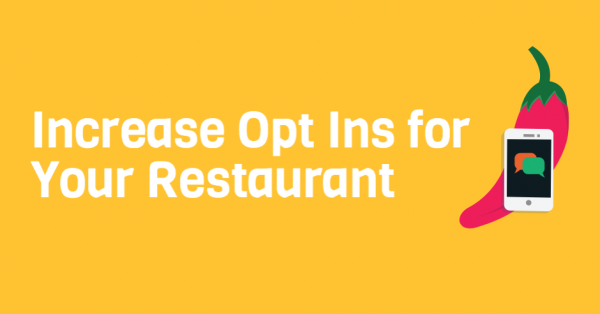 You own a restaurant, and want simple, yet targeted list growth methods. Improve your opt in performance with these top tips. Track individual performance, and run week to week competitions. Challenge your staff, and offer incentive based rewards. For example, top weekly performers might receive a monetary reward, or paid time off. Make it a collaborative effort, and encourage high level performance. Hold monthly goal setting meetings, and outline current progress. Doing so makes sure every single staff member is on the same page, and understands individual expectations. Don’t make your in store print materials too complicated. Provide your keyword, the designated short code, and the basic incentive. Don’t clutter the graphics with crazy fonts, or too many decorative elements. Ideally, the simpler, the better. Get to the point, and don’t distract patrons with unnecessary information. Encourage one on one conversations. Build trust and increase brand loyalty with verbal engagement. Encourage servers to prompt new opt ins via word of mouth. Brief all servers on SMS marketing best practices, and how to draw in new subscribers. Outline a basic elevator pitch, but don’t make the explanation too complicated. On the same hand, don’t overuse sales jargon. Partner up with the top SMS marketing provider, Slicktext.com. Give us a call today at 1.800.688.6290 to sign up for your free plan. We offer a dense platform packed to the brim with educational resources and loaded features. Looking for some more guidance? Give our Beginner’s Guide to SMS Marketing a read, or skim through our helpful and easy to read infographics.